Toyota of Plano has aggressively targeted Uber drivers in the hope that they will recommend the dealership to their passengers. "Word of mouth is still the best advertising there is," says General Manager Rusty Gentry. Toyota of Plano offers its best deals to Uber drivers, who make up about 6 percent of the store's new-car buyers and provide word-of-mouth advertising for the dealership. Hail a black car by smartphone in the Dallas area, and there's a decent chance you'll find "Toyota of Plano" on the license plate frame. By offering hefty discounts and tailored online advertising, the dealership in Toyota's soon-to-be U.S. hometown has aggressively gone after customers who drive for Uber, a smartphone-powered taxi service that allows people to earn money giving rides to strangers. The dealership sells about 200 cars annually to Uber drivers -- about 6 percent of the 3,200 new cars it sells in a year. Uber drivers get the dealership's best offers. It's a form of marketing: Future passengers may notice a Toyota of Plano license plate holder when they get picked up by a shiny new car. And when the driver and passenger start talking, a driver who got a great deal is far more likely to gush about Toyota of Plano. "Word of mouth is still the best advertising there is," Rusty Gentry, general manager of the single-point dealership, said in an interview. "So we'll take an aggressive deal. We know what the advertising's worth." Losing money on a sale might seem like a bad strategy, but Gentry said it makes sense considering that dealers spend an average of $400 on advertising per car sold. "If I lose $1,000 to sell a car and [an Uber driver] sends me three customers," he said, "I still come out ahead." Toyota of Plano's strategy isn't surprising, given the size of the Uber-driver market. At the start of the year, San Francisco-based Uber reported having 162,037 active drivers in its network nationwide, each of whom finished at least four trips in December. Thousands of drivers sign up each month, and many of them must buy or lease a new car because Uber doesn't allow older cars into its program. The company has lined up preferential new-car financing from Chrysler, Ford, General Motors, Hyundai, Nissan, Toyota and Volkswagen. It also inked a deal with the U.S. arm of Santander Bank to offer lease-to-own financing to drivers whose poor credit might otherwise stop them from getting a loan. Hybrids such as the Toyota Prius are particularly popular with Uber drivers, who must pay their own fuel costs out of their fares. 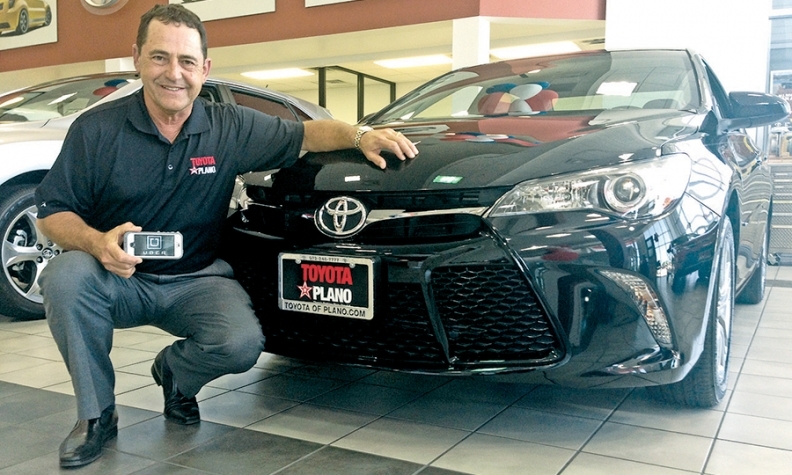 Toyota of Plano has taken more steps on its own. It built a dedicated landing page on its website for Uber drivers and optimized it for Internet search engines. Customers who search Google for relevant phrases, such as "Uber discount Toyota," will find Toyota of Plano high on the first page of results, immediately after Uber's own Web page. Some dealers might balk at giving Uber so much help. After all, Uber represents an alternative to personal car ownership. Gentry doesn't see it that way. He uses Uber about twice a week. To him, it isn't a substitute for a personal car, but a way to go to a Dallas Mavericks game or grab dinner downtown without the hassle and cost of parking. "A lot of the time [the driver] bought their car from me, which is really cool," he said. On one recent excursion, Gentry hailed a car from his smartphone and was picked up by a four-year-old sedan with about 60,000 miles on the odometer. It wasn't a Toyota, though. It was "the second-best-selling Japanese car," Gentry said, avoiding naming names. "I told him, 'You look like you're ready for a new Toyota,'" and gave the driver a business card, Gentry recalls. "My wife calls me a walking billboard. I'm always advertising."